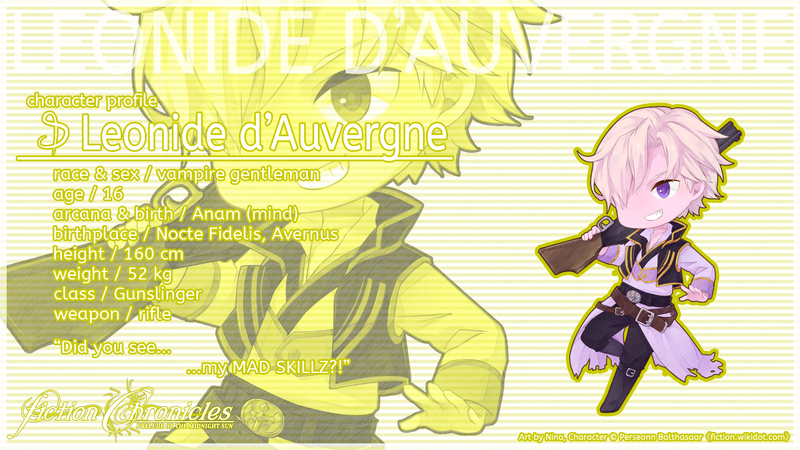 Leonide "Leon" d'Auvergne is a vampire Gunslinger from Nocte Fidelis, Avernus. He is the son of Charmaine and Nero. After being separated from his twin, Blanche, he was found lying on the side of a road by Aello and Sleipial. Leon turned out not to be able to function without his twin, even needing an assistance on picking a meal. Pitied by Aello and Sleipial, they both take Leon with them and also help him find his twin. He has lavender eyes and misty rose unruly hair. He is more easygoing and flexible than his sister, but he prefers crude and wacky ways as opposed to elegant and classy way. He is somehow enslaved by his sister to do her bidding and he cannot resist her in any way. Leon's immortalization portrait was drawn by Blanche. In battle, Leonide wields a rifle and is best at long range combat, while he uses a knife in close combat. Contrary to what his friends think, Leon cannot properly use one-handed projectiles like crossbow or guns. He can make a limited amount of dishes, most of which are soups. Although he is quite able, he cannot choose which soup to make, requiring Blanche to choose for him. When idling in a town, he usually walks around in marketplace with Pierce. Leon contributes money to the party periodically using his mother's bank account, but he left this responsibility to Blanche once they are reunited. His journey represents his will, aggression, and competitive instinct. He will accept his aggression and his anger and allow their healthy expression in his life. If he is honest with himself and others, they are free to be the same with him. Leonide's name was previously "Leonidas", after Leonidas of Epirus (teacher of Alexander the Great). However, to keep the French name theme among the family, his name was changed to Leonide. He is 13 years old during the event of Prelude of the Midnight Sun, 160 cm tall and weighs 47 kg. Leonide's design point is his hairstyle: wavy short cut with fringes that can cover his face (refer to ジンコウガクエン２on Alternate Media Section). His base outfit has been changed from jacket and pants to a more noble-like outfit. 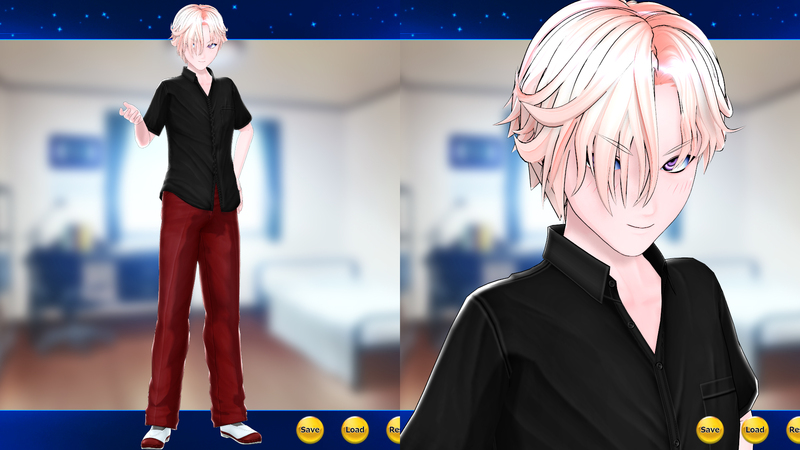 He used to have a typical blonde hair and blue eyes; this has been changed to misty rose and lavender eyes, in addition to pink skin. Costume 1 of Soulcalibur III, IV, and Broken Destiny uses his old yellow jacket and blue pants (This is actually an artifact color scheme from RPG Maker 2000). The Broken Destiny Costume 3, created by Tanleeseng, is a gaudier version of this, which I like very much. By extension, the Costume 1 of Dynasty Warriors 7 and 8 also uses this concept, but recolored since he looked ridiculous. Costume 2 of Soulcalibur IV, Broken Destiny, and Soulcalibur V is his power-up form named Emperor; this is is a homage to Kamen Rider Kiva Emperor, but with less gold and more blood red. Costume 2 of Dynasty Warriors 8 started using his current concept. 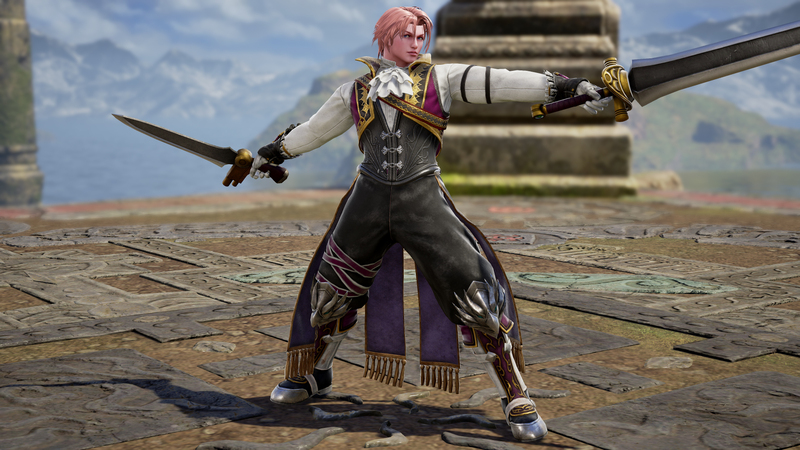 This carries over to updated Soulcalibur V Costume 1 and eventually made it to Soulcalibur VI. Costume-wise, his Samurai Warriors 4 fits him best. Costume 3 of Soulcalibur V is a stereotypical vampire outfit and a homage to vampires from Heroes of Might and Magic IV. Bleh bleh!